If you don’t absolutely love our kitchen, you can custom design your own. We’ll even toss in a designer and $30,000 to spice it up. Want to stretch a kitchen island? Or curve it? Go ultra-modern? Or just make our kitchen a little more you? 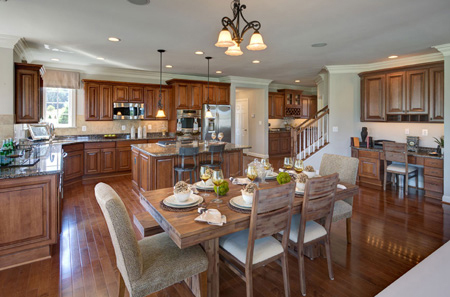 Now you can turn your vision into your own custom kitchen at any CarrHomes’ singlefamily community. It’s easy with a seasoned designer to help and $30,000 to spend any way you want. Come see: the Meadows at Great Falls, Clifton Point in Clifton, and Waterford Creek in beautiful western Loudoun County. Priced from the $700’s to $1 Million+. Offer valid on purchases now thru December 31, 2017. Offer subject to change without notice and cannot be combined with any other offers.